Two pupils from Kings Priory School present Lisa Jones, from the NSPCC, with a cheque from their fund-raising efforts. Fantastic fund-raising pupils have been putting their best feet forward in aid of a national children’s charity. Youngsters at Kings Priory School have collected more than £7,000 for the NSPCC. The bulk of the cash came from First School pupils, who took part in a Daily Mile sponsored fun run. They were tasked with raising as much money as they could, and running as far as possible in allocated 30-minute slots. The total raised so far from the run stands at £6,818, which was presented to NSPCC representative Lisa Jones in a special assembly. Meanwhile, youngsters in Kings Priory Middle School have been counting up the cash from their own collections. Pupils in Year 5 and 6 participated in NSPCC workshops in January and decided to set up collection boxes around the school. So far they have raised £237.50 for the charity. 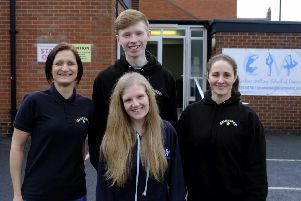 The school supports a number of charities and good causes throughout the year as part of its role in the local, national and international community.